An estimated 5.4 million Americans are living with Alzheimer’s. Caring for patients with Alzheimer’s and other forms of dementia is estimated to cost the nation as much as $215 billion. According to a new national survey, a third of family members and friends caring for a loved one with the disease reduced their work hours or quit. And 28% of caregivers eat less or go hungry. The report was released right before an Alzheimer’s conference that begins here in Washington today. Diane Rehm and a panel of guests discuss why Alzheimer’s is one of the most costly diseases for families and the nation. "Will the Next Five Years Witness an Innovation Wave in Medicines for Alzheimer’s?" Will the Next Five Years Witness an Innovation Wave in Medicines for Alzheimer’s? MS. DIANE REHMThanks for joining us. I'm Diane Rehm. A new report finds that family members caring for loved ones with Alzheimer's are making even greater financial sacrifices than previous thought, including quitting their jobs. With me to talk about the financial toll Alzheimer's takes on family, George Vradenburg, founder with Trish Vradenburg of Us Against Alzheimer's, Dr Katalin Roth of the George Washington University, Beth Kallmyer with the Alzheimer's Association and Mark Dunham who cared for his wife with Alzheimer's. MS. DIANE REHMJoining us from a studio in Santa Monica, California, Michael Hurd of the Rand Institute. I'm sure many of you will want to join the conversation. Give us a call at 800-433-8850. Send your email to drshow@wamu.org. Follow us on Facebook or send us a tweet. And welcome to all of you. MR. GEORGE VRADENBURGGood morning, Diane. REHMGood to see you all. Beth, I'll start with you. Tell us about the Alzheimer's Association's new national survey into the costs of caregiving for Alzheimer's patients. KALLMYERSo, you know, we know that the cost of care is enormous to the country, to all Americans, but the Alzheimer's Association wanted to conduct a nationwide survey to look at the personal impact of providing care on the finances of those caregivers. REHMAnd how did you do that? KALLMYERWell, it was study that was done by a company that does scientific surveys for us so it's a nationally representative study of over 3500 individuals. And from that study, there were about 500 of them met the criteria to be a care contributor. So a care contributor was somebody that provided care at least once a month for a year's time or paid for care at least once a month for a year's time. So we know these people were intimately involved in providing care for somebody with Alzheimer's or dementia. REHMAnd did you find things you didn't expect? KALLMYERIt was startling to see the sacrificed being made. People were cutting back on basic necessities, things like food. Family members were telling us, through the survey, that they had to make decision about putting food on the table. They were making decisions about skipping their own medical care or not filling their own prescriptions so that they could fill the prescriptions of the person they were caring for. KALLMYERThey were taking money out of their savings. They were sometimes selling things. And so, you know, this impact was really significant on their day to day lives. REHMAnd to you, Michael Hurd, as an economist, give us an idea of your findings on the cost of caring for those who have dementia or Alzheimer's. HURDWe published a study in the "New England Journal of Medicine" in 2013 that looked at costs of dementia and we found that the cost associated with dementia or I would say due to dementia, because we adjusted for co-morbidities, that is to say, diseases that people had that they might have had anyway regardless of whether they had dementia, we adjusted for those things and found the costs associated with dementia or due to dementia were actually higher, in total, than the cost due to heart conditions or to cancer, making it the most costly disease. HURDThe primary cost component of that was not medical services as such, but 75 to 80 percent of that cost was, in fact, due to caring for the people who are suffering from dementia. And there are two cost components to that. The first is formal care, that is care delivered in a nursing home setting, or purchased care that comes into the home, such as care from a nursing home service -- long term care service. But the second component and the most expensive was the cost of informal care, that is care provided typically by a spouse, a daughter, daughter-in-law would be the main contributors to that. HURDThat is kind of consistent -- I'm sorry? HURDIt depends upon the valuation we put on how we valued the informal care cost, but we estimated that in 2010, the cost using our best estimate, to be around $160 billion per year due to dementia. REHMWow. And to Mark Dunham. I know you cared for your wife until she died in 2011. You actually quit your job to do that. DONHAMNot be measured. And then, their career, you know. I left my career so I was out of the workforce for five years. The company I worked for lost a valuable employee. I didn't pay taxes for that period of time. And ultimately, it will affect my long term retirement. DONHAMI was a sales and technical rep in the printing and packaging industry and so I had a pretty booming career and I looked at the overall cost, it cost me over a million dollars to be off for that amount of time, if I look at the lost wages, amount of money it took me to survive that period of time. And that was with long term care insurance. I was fortunate enough that we bought long term care insurance, which most people don't do, but Chris had a family history and because of my family background, my father had a stroke, we knew it would be a valuable asset if we needed it. REHMWow. And when she finally died, were you able to go back to work? DONHAMYeah. I was just 50 years. She was 54 when she passed away. So it took me about six months. I did find work again and the first year was really rough getting back to a working position, but so far, successfully, I've done it. You know, now I need to, you know, up my 401 (k) s and try to, you know, plan financially for my future. REHMI'm so sorry about your loss. DONHAMThank you. One thing I would say is that we made the most of it. It's made my life richer and more empathetic to not only what we went through, but also be able to reach out to other people that are going through similar circumstances. REHMIndeed. Dr. Roth, are these the kinds of caregiving stories, you hear lots about? ROTHI do. I primarily see older people with dementia as a geriatrician and palliative medicine physician, although I have seen some very unfortunate situations of early onset Alzheimer's as was just described. So people really -- I see a lot of couples where the unaffected person was really looking forward to a beautiful retirement with their spouse and that doesn't happen. Instead, retirement consists of having to care for somebody who's slowly slipping away and it's very difficult for people who are already -- it's very difficult for anyone to be a full-time caregiver. ROTHAnd all of the physical stresses of that. And then, when the well person has her own health challenges, she may have some arthritis, she may have medical issues of her own, and then he or she is taking care of somebody who has lots of physical needs, it's a tremendous burden. It's not only the time and the isolation. There's tremendous isolation, which I'm sure we'll talk about, but it's a physical strain as well. REHMAnd turning to you, George Vradenburg, I should say upfront that I am involved with Us Against Alzheimer's, appearing in the play that your wife, Trish Vradenburg, has written. 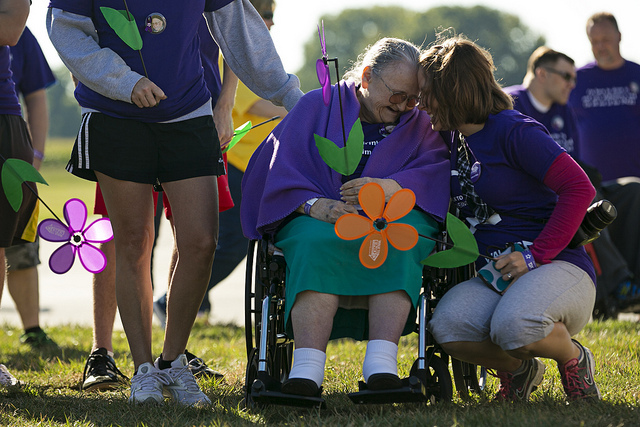 We've done that around the country to highlight Alzheimer's. A person with Alzheimer's also has, on average, I gather, more doctor's appointments, more visits to the hospital. VRADENBURGYes. It's a rather significant number. For Medicare, it's about three times the greater cost for a person with Alzheimer's than a person without Alzheimer's who has similar diseases. And for Medicare/Medicaid, it's 19 times more expensive for a person with Alzheimer's than a person who does not have Alzheimer's but the same otherwise -- the otherwise, the same conditions. So one of the things that the Alzheimer's Association report highlights is that most people think that these costs are covered by either Medicare or by Medicaid and most of them are not. VRADENBURGWhile Medicare will cover most of your doctors and hospitals and skilled nursing facility cost, most not all, but the out-of-pocket cost of caring for a person at home, whether it be everything from adult diapers or long term care, are not covered by Medicare or Medicaid. REHMGeorge Vradenburg is co-founder with his wife, Trish, and chairman of Us Against Alzheimer's, that's an advocacy organization. We'll take a short break here. When we come back, we'll talk further, take your calls, email. I look forward to hearing from you. REHMAnd welcome back. Four people are with me here in the studio, George Vradenburg of Us Against Alzheimer’s, Dr. Katalin Roth of George Washington University School of Medicine, Beth Kallmyer of the Alzheimer's Association, an advocacy group and Mark Donham, he quit his job to take care of his wife with Alzheimer's. He's a former board member of the Oregon chapter of the Alzheimer's Association. And joining us from Santa Monica, California, Michael Hurd, director of the RAND Corporation study -- Corporation Center for the Study of Aging. REHMBeth, you've heard Mark Donham talk about his loss of income. What's the average loss of income? KALLMYERThe Alzheimer's Association survey actually found that on average, people that cut back on work or stopped work entirely like mark did were losing an average of $15,000 a year. So it really becomes a bit of a double-whammy because as Mark was saying, they're not bringing in income, and then they're incurring additional costs. And so we know that the financial sacrifices are really significant. REHMAnd George Vradenburg, many caregivers incorrectly assume that Medicare or Medicaid is going to take care of all their expenses. VRADENBURGMedicare will take care of some of your expenses in terms of hospitalizations and doctors' visits, but Medicaid will only cover a nursing home admittance if you basically impoverish yourself. So you go down to basically to basically zero income or close to zero income and zero assets. So for the vast majority of us, the vast majority of us, including middle-income Americans and low- and middle-income Americans, Medicaid is not going to be the answer. So you have to do this yourself, whether it's home care, or whether it's nursing home care. ROTHThat's correct, and people really -- I'm not sure, I haven't read these studies, but caregiver prices are $10 to $15 an hour, you multiply that times 24 hours a day, seven days a week, you can get some idea of what the costs are to families in terms of their time. And any kind of respite, time to go to the hairdresser, time to go to the doctor yourself, time to go to the grocery store, whatever it is that people need to do to keep their family lives running, they can't leave the affected person alone, and they need assistance. ROTHSo it takes a lot of time and a lot of people to take care of someone with Alzheimer's. REHMIndeed. Here's an email from Julie in Michigan, who says caregiving, someone to see to their personal hygiene, make sure they don't wander away, prepare their food, feed them is what dementia sufferers need, not expensive tests or treatments. But this is the only disease I know of where Medicare and private insurance refuse to pay for care until the patient has depleted all of his or her resources. Can you comment on the disparity between the level of support provided by Medicare and private insurance for other illnesses and that provided for dementia? Mr. Hurd? HURDThis is a social choice we have made. We've made the choice that Medicare will pay for acute illnesses and other diseases among those over age 65, but those are identifiable diseases such as cancer, heart conditions and similar. We've made the decision that Medicare will not cover long-term care. We've also made the decision that there's a back-up insurance plan, Medicaid, that will cover those costs, provided the individual does not have the resources to pay for those costs him- or herself. REHMSo thereby you have to spend down everything you have. HURDYeah, now it's a complex situation where the amount of assets that can be retained depend upon whether the person is married, the state the person is in and so on. For a single person, it's pretty clear that you have to spend, unless there's some probability the person will return to the community, the person has to basically impoverish him- or herself. ROTHSo I was going to add that there are actually negative incentive built into our current payment system. So Medicare doesn't question the utility, for example, of a pacemaker replacement in somebody with advanced Alzheimer's. So the cardiologist's fee, the hospital fees, all of those are paid for without any question about whether the procedure might in fact in any way improve the person's quality of life, and the cost isn't questioned. ROTHSo we have a lot of negative incentives right now. We don't pay very well for time. So time-based care is what I need to provide to my patients. We don't pay for social workers to spend time with families of patients with Alzheimer's to figure out the best way to support them. I can't possibly see a person with Alzheimer's in a 15- or a 30-minute visit, and yet my time is not -- unless it's based on procedural issues, it's not well-reimbursed. And we -- I will say we also don't have enough trained nurses, nurse practitioners and Pas and physicians to work with the current numbers of dementia patients and/or for the future. KALLMYERCurrently there's some legislation before Congress that the Alzheimer's Association is supporting highly and advocating for, and it would allow following an Alzheimer's diagnosis, it would allow that family and that person with the disease to meet with a social worker perhaps or a nurse practitioner to help them do comprehensive care planning. KALLMYERAnd we know that this is one of the things in the face of these enormous costs that planning can make a difference for people. It isn't going to solve it, by any stretch of the imagination, but it can make a significant difference for them if they are educated about what's out there, and then they make a plan for themselves. REHMGeorge Vradenburg, what does the future look like for Alzheimer's disease and Alzheimer's patients and the cost of caring for Alzheimer's patients? VRADENBURGThey're all going in the wrong way, more people with the disease as our nation continues to age. Actually one of the great benefits of the 20th century was all the diseases that we cured and all the public health interventions that we made that extended our lives. And now we are living in an age when we have three generation and four generations families, so that in fact now we're aging as a nation, and it's a similar phenomenon around the world, which means more people aging, which is the highest risk factor for the disease, which mean more caregiving, which means more financial impact on the nation. VRADENBURGOn the cure side, there is some hope, although we have 17 drugs in final stages of testing, for this disease, which would be on schedule to get to market by -- within five years. Those -- who knows whether they're all going to successful, not likely, but some may be. But that means that we're now going to have some drug costs on top of these costs for a period of time, until we get sufficient innovation to actually reduce the incidence of the disease and to begin to reduce these costs. REHMHere's an email from Jeff in Cleveland, Ohio, who says, my mother suffered in a facility for over six years, costing most of my parents' life savings of $700,000. She would have preferred that money go to college for her grandchildren. I won't read the rest of this because it has to do with the wish to die, which we may get to a little later, but how does this resonate with you, Mark? DONHAMYeah, it's a devastating disease, facing, you know, the financial impact, and it hits home for me because that's the kind of money we spent or I spent in caring for my wife. REHMDid you ever assume you might be able to put her into a facility and then carry on with your work? DONHAMWell, I actually did have her in care facility at the very end of her life, mostly because I ended up in the hospital, they thought I was having a heart attack over the stress and strain of the finances in taking care of my wife 24/7 and losing sleep and not taking care of myself because I was caring for her. And so I realized at that point that if I didn't do what all the books told me to do, which was take care of yourself, but when you're on the treadmill of caregiving, you don't know how to do that, and then I started getting extra help. DONHAMAnd with long-term care insurance, I was able to place my wife in the best care and then turn my energy into advocating for the best care she could have and loving her every day I was there, I was there eight to 10 hours a day, minimum, because I didn't put her there to get rid of her, I put her there to get the best care possible and stay healthy enough to survive it myself. REHMI understand. All right, we're going to open the phones, a caller in Lexington, Kentucky. Ellie, you're on the air. REHMHi. Go right ahead, please. ELLIEYeah, I just called in, I am 29 years old, and my mother, Barbara, was diagnosed with Alzheimer's about three years ago. She's 58. And so my husband and I made the decision to move from the D.C. area back to Kentucky, and I resonated a lot with this story because I've had to shift from full-time to part-time work not only to balance care for her, but also now I have her son, and so the costs of caregiving are just very demanding. REHMSo you are clearly part of what we call the sandwich generation. ELLIENo, it's a big challenge. KALLMYERNo, I mean, we talked -- we talked to hundreds of families, thousands of families just like that, and, you know, one of the things that I can tell you that is important to do, and Mark mentioned this, is to find ways to take care of yourself. This disease goes on for a period of years, and it happens slowly, often, and so people don't realize how bad things are getting as the caregiver. They just, they think at the beginning, oh, I've got this, I've got this handled, and then things get worse over time, and it's so important for them to get help and to access some of those community resources to help them provide that care so that they can do it over the long haul. REHMSo Dr. Roth, do you see both the Alzheimer's patient and the caregiver simultaneously? Do you, are you able to direct your attention to both simultaneously? ROTHWe do our best to do that. I mean, to support the patient, I have to support the caregiver. And he or she is under great strain and needs a lot of counseling and advice. I did want to mention to the caller that I hope in the early stages of recognition of Alzheimer's or other dementias in a patient, it's really important to think way in the future and try and get legal affairs organized and also to talk about advanced care planning while the affected person still is able to talk about his or her hopes and dreams and preferences. So often people avoid that. REHMAnd you're listening to "The Diane Rehm Show." Now that takes me to the second part of this email, where Jeff in Cleveland said, about his mother, who suffered in a facility for over six years, talked about the costs, he goes on to say she also wanted a gun to be brought to her. She said that death would have been a better solution. We, the staff, the hospice and family, hoped for her quick decline, but it was long and slow. The Alzheimer's Association was very helpful. I wonder how often that comes up in the thinking. DONHAMWell, you read about it all the time, where someone does take the life of their loved one to stop the suffering, and then they end up in jail. I hear it, every year it happens around the United States. The challenging part, I know, is, you know, if -- I know living in Oregon, where you have a right-to-die state, not getting into the politics, but you have to be of sound mind to do it yourself. My wife never would have done it early enough, before the disease progressed. REHMYou know, there was an article in the New York Times magazine a year or so ago about a husband and wife who made that plan together, who knew she was progressing and made the decision as to when, while she was still of sound mind to take her own life. That's a pretty drastic solution, Beth. KALLMYERYou know, I think one of the most important things that the families can do is have these conversations. KALLMYERAnd to talk about this and to put things in place. We have wonderful hospice programs and palliative care that's available to everybody in this country, and certainly Medicare covers hospice, for example, and so people can access that, and it can bring in a significant amount of support and help them as they go through the dying process. ROTHActually, I agree with what you say. Alzheimer's and other dementias are very chronic diseases, and the hospice benefit is only available during the estimated last six months of life. So we see many families who would like to put their family members in hospice, but they're really not hospice-eligible. And similarly, the states which do have laws that allow death with dignity, or the California act is called the End of Life Options Act, they are really only applicable to people who have terminal illnesses and are very -- are very near death. ROTHSo I don't think that those -- in Oregon or in California or in the state of Washington, a person with mid-stage Alzheimer's would not be able to access the assistance of those statutes. REHMGeorge Vradenburg, you talked about the drugs currently in process. How much are they going to cost? VRADENBURGWell, obviously they haven't been priced yet, but because they're infusion products, these are not drugs necessarily that you would take by a pill but by actual injections, so they will be probably be fairly expensive. You know, anyone's guess, but it will be in the tens of thousands a year. Whether Medicare covers that or not is still an unknown question. REHMGeorge Vradenburg, co-founder and chair of Us Against Alzheimer’s. Short break here. When we come back, more of your calls, your comments. Stay with us. REHMAnd welcome back. Here's an email from Pat in Painesville, Ohio. She says, "what do other countries do, like Canada, for example?" George Vradenburg. VRADENBURGOther countries are providing a variety of supports for caregivers and for those with the disease in their chronic state. But they are recognizing that those supports may not be sustainable in the long term themselves, and so they're struggling with the same problem, although every health system's different. France has a very sophisticated system of national memory clinics. The UK government has the National Health Service, as does Canada. So they're providing a variety of supports. But one of the things that's led Prime Minister Cameron to be so active in this space is he's deeply concerned about the long term sustainability of their National Health Service, if we do not solve this disease. REHMAll right, and here's an email from Lori. She's with the Michigan Alzheimer's Disease Center at the University of Michigan Health System. And we've received a few like this. She says, "while I'm pleased you're talking about the cost to families about Alzheimer's, not all dementia is Alzheimer's. Too many people use the word Alzheimer's as a synonym for dementia. As the daughter of a man who died with Lewy Body Dementia, the second most prevalent neurodegenerative dementia in America, affecting some 1.3 million of our citizens, this misuse is deeply painful." How do we look at this whole area of dementia within the Alzheimer's Association, for example? KALLMYERWell, the Alzheimer's Association provides care and support for people with all types of dementia. Alzheimer's is the most common type of dementia, but the other dementias certainly make up a large portion of who's impacted. REHMHow do we differentiate between the dementias? KALLMYERWell, one of the, one of the things that is happening is we're getting better at diagnosing Alzheimer's disease, we're getting better at diagnosing some of these, some of the other dementias, frontal temporal, or Lewy Body, vascular dementia. We aren't where we need to be, though. We still have doctors that, you know, most people are being seen by primary care doctors, not specialists, not neurologists, so we need to educate primary care doctors and others to be able to figure out, you know, what is the evaluative process and how do we make the appropriate diagnosis so that people can access what treatments are available as well as support services. REHMMark, how was your wife diagnosed? REHMWere brain scans done as well? DONHAMBrain, MRIs, neuro psych testing. REHMAnd what did they show? DONHAMWell, they, you know -- in the case of clinical trials, they don't really tell you what's going on, but as you go through the process, you start to see deficits when they start to happen. REHMTalk about those clinical trials, George. VRADENBURGThis is something that all Americans can do, and all Americans should do, and that is to sign up for a clinical trial, or for a registry that will determine and follow you to determine whether or not it's useful for you to participate in a clinical trial. I would urge everyone in America to go to brainhealthregistry.org to sign up, to provide a variety of information about your own family history and your own conditions. And take a -- some games on the site, and they will inform you whether -- if in fact you may quality for clinical trials. VRADENBURGBut this is one of the major stumbling blocks in the speed with which we're getting to a cure, is that we don't have enough people who are participating in clinical trials. And as a consequence, there are many very promising drugs that are not being tested because we don't have enough people to participate in these trials. So signing up at brainhealthregistry.org is one way to do that. REHMHey, let's go to Nancy in San Antonio, Texas. You're on the air. NANCYMy mother will be 92 next week, and she came -- I don't know, she was diagnosed in 2010, she lived with us for two years. And then we got to a point where we could not care for her anymore. She's in an Alzheimer's care facility that costs $5500 a month. And what a lot of people don't understand is a normal nursing home is not, either not equipped, or they will not accept Alzheimer's patients, and if they do, oftentimes they're kicked out because of their erratic behavior. REHMYou want to comment, Beth? KALLMYERYeah, I think that it's so important that we help families recognize what's available in their communities, because there's -- it really depends on where you live. If you're in a rural area, it's different than if you're in a city or a suburb. And we know that we need to have training for people that work in these facilities so that they understand the best way to interact and to treat and to support people, their residents living with Alzheimer's. And families are really challenged trying to find the best care for their families. REHMBut now, my husband, as you perhaps know, died after suffering from Parkinson's disease for quite some time. He was at a facility that had set aside one entire floor for Alzheimer's patients. I'm just wondering about the training required to care for those Alzheimer's patients. Is it specific to those patients, Beth? KALLMYERYou know, the state laws generally govern this, and so it is different in every single state, as you can imagine. So there -- it varies, you know, for nursing homes, you've got Medicare is involved in setting some of those guidelines, and Medicaid. But as we know, many assisted living programs for people with Alzheimer's, that's not covered by Medicare. And there's less regulation on that, if any. So it really depends on the state. But it is important for those workers to understand how to interact with somebody with Alzheimer's disease and to really have a sense of that, so they can provide the best care. REHMAnd to have very special training, I would think. Here's an email from Tom in Danville, Virginia, who says, "We know the financially fortunate can and do quit jobs and sell assets to care for elderly and demented loved ones. What do those in rural America who have nothing in the way of disposable income and assets do with their elderly and demented loved ones?" Michael Hurd. HURDWell, the program that we have is Medicaid, as we've talked about, and that is for people who have no financial resources. For people who have modest financial resources, it requires that they spend them, as we've discussed. But it -- Medicaid is that program. One thing that was mentioned earlier is support for the caregiver in terms of decision making. Legal assistance, financial assistance. There is a whole web of programs, things that people need to know. Now from the Affordable Care Act, there's some experimental programs to see how much that helps. HURDThis is a relatively cost efficient thing that we could do to help caregivers. And in the case you're talking about, a rural situation, that kind of advice would be invaluable, to know what's available. REHMAnd to George, what do you suggest that families do to prepare for caring for someone with Alzheimer's? VRADENBURGWell, I think the number one thing they can do is save. They can make sure that they've thought through their retirement. You can look through this as a retirement security issue. We have not saved enough money as Baby Boomers to sustain a 30 or 40 year retirement. So if in face you're hit on top of that with long term care costs, you're in real trouble. So saving, saving at greater rates is vitally important. Beyond that, getting help as a caregiver, almost immediately turning not just to end of life, which is important to think about in those earlier years, but also to caregiver support services. REHMExactly. I want to bring in an email from Herman in Rochester, New York. "Please discuss how assets can be protected by placing them in a supplemental needs trust, a qualified disability trust. The money in the trust can be used to enhance the patient's quality of life, but is not part of the patient's assets." Do you know about this, Mark? DONHAMWell, not specifically, but I know, you know, addressing it early and getting legal advice, long term legal advice. There are some very specific things about when that's done, and how early it's done. A five year rule about moving assets and things. And so, yeah, seeking that legal advice early. REHMSo you've got to have help. DONHAMYou have to have help, and you need to have it early, as soon as you know that you're accepting that the disease is happening, to turn for that legal advice is really critical. And then you can walk through what really works and what doesn't. KALLMYERAnd also, if people have resources, they should talk to a financial planner. They should talk to a professional financial planner, because it really is complicated, and you want to make sure that you're educating yourself about what is available to you and what your best choices will be. REHMA lot of people talk about long term health or care insurance. That's expensive. Mark. DONHAMIt really is. I know personally. My wife, although I have to say, you know, in the long term, my wife had it through her work, so we took advantage of that. And in the end, it gave me all the options to look for the best care for her. Of course, I've looked at it with just one stepson, for myself, I'm paying for it privately, and it is expensive, but it's a tradeoff of, if I need it, I didn't pay enough for it. If I never use it, it seems like a waste of money, which is sort of like all insurance. REHMIsn't it something like $15,000 a year? DONHAMThe earlier you purchase it, the less money. People don't start thinking about it until later in their life, and then it can be quite expensive. VRADENBURGThere have been proposals over the years to add to our Medicare/Medicaid sort of portfolio support. Long term support services, financed as a mandatory tax on top of Medicare and Medicaid, because not everybody gets these long term things. So if in fact you're over 65, perhaps ten to fifteen percent, huge numbers, but that means 80 to 85 percent are healthy. So if everyone pays, and you can support at a relatively low rate for everyone, the costs of -- catastrophic costs for the families that do suffer for this. It has fallen on political rocks. REHMAnd you're listening to "The Diane Rehm Show." Let's go to Dawn in San Antonio, Texas. You're on the air. DAWNGood morning. My name is Dawn. I have a husband that is very young. He's 60, with Lewy Body dementia. Number one, I chased physicians to diagnose him for four years. I do not have any support, Medicaid or Medicare. I have begged to put him in trials. He cannot quality for trials. And also the informal time based care babysitters in the home is average 20 to 25 dollars an hour for caregivers, and of course, clinical RNs are 80. So your price was off with the in-home care. REHMYeah, but why couldn’t he qualify for any of the programs that test? DAWNBecause we've done everything right. If you've done -- oh, for the trials? DAWNI have begged, I have begged the physicians to put him in trials. I have no idea. They won't put him in a trial. VRADENBURG...and so persons who are in the moderate stages are not likely to be the populations in which trails are being conducted. And it is tragic, because the field has moved to prevention trials, which basically means those with moderate to late stage disease, at least for the foreseeable future, do not have programs underway to try and deal with that type of treatment. REHMAll right. We've been thus far talking about the costs in both personal and dollar terms. Now, what is the projection, George, for five years from now, for ten years from now, as to what Alzheimer's is going to cost this country, unless we do something about it. VRADENBURGWell, I think the estimates now, at least by 2030, is it will cost us a trillion dollars a year, or close to a trillion dollars a year in the aggregate. So what we're -- I'm sorry, that's not right. It's a trillion dollars by 2050. But what we're looking at is a situation where the second inconvenient truth of the century is that we are aging, and that the cost of health care for the chronically diseased and over 65 are going to grow as a percentage of our GDP, as a percentage of global GDP. So we are going to experience this, and there are health disparities. VRADENBURGAfrican-Americans twice as likely to get the disease. Latinos one and a half times more likely to get the disease than non-Hispanic whites. And those families, typically, at least in the current state of America, are lower income families. So the health disparities are gonna get driven down. And by 2050, the majority of people in America are gonna be African-American and Latinos and Asians, and the health of America is gonna be the health of our minorities. REHMSo what do you hope to accomplish at the Alzheimer's gathering going on here in Washington beginning today, Beth? KALLMYERThe Alzheimer's Association Advocacy Forum is bringing nearly 1200 advocates to Washington to talk to their congressman, to talk to their representatives, about making an investment in research for this disease. KALLMYERWell, you know, right now the, Alzheimer's is funded at, it's just about a billion dollars and the scientists tell us we need two billion dollars a year to make a significant impact. REHMWell, let's hope you and all of you have an impact. Thank you all so much for being here and thanks, all, for listening. I'm Diane Rehm.